Every day they arrived one by one, each with deep, sunken eyes symptomatic of sleep deprivation and languid, disheveled steps. Every day they lined up in front of Korea University’s (KU) Main Hall, their bodies tense and ready. This was the daily reality of manual laborers in KU, whose contracts were disregarded by the school administration. Every day they held a porous line of defense against those who, under the auspices of the law, would have taken away their rightful vocations. Now the administration has admitted defeat, but its concession leaves behind more suspicion than closure. Manual laborers in KU were beset with another flurry of inordinate measures last December. In 2012, the KU administration approved a contract dictating that the number of manual laborers working eight hours a day would not be reduced under any circumstances. Yet when around 10 laborers retired last year, the administration announced its plans to replace them not with other laborers from the same employer, C&S Asset Management Company (CNSAMC), but with their cheaper counterparts who work only three hours each day from Kobi, another employer. The KU branch of the manual laborer labor union was livid over the school administration unilaterally breaching their contract, and more so due to the administration’s attempt to pass this over as a simple misunderstanding between the laborers and their employer. The administration, on the other hand, defended its decision on the grounds that it was facing higher costs borne from a higher minimum wage, which increased from 6,470 won to 7,530 won last year. Additionally, the administration pointed to the stationary tuition fee as evidence that it was not at liberty to increase expenditure on manual workers, contending that it could not employ the same laborers under the same budget constraint when their wages have risen. While the school administration’s decision may have seemed legally suspect, its actions were well within legal boundaries. KU’s administration, like most other private universities, adopts the indirect employment model; it refrains from employing manual laborers itself, instead employing a subsidiary company that then recruits laborers at the administration’s behest. 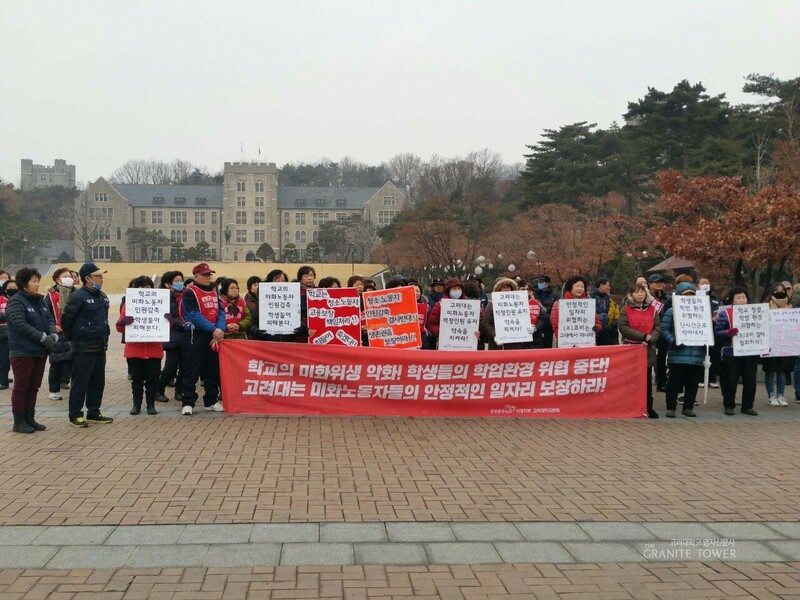 “In doing so, it is absolved of any legal responsibility regarding employment, since the laborers enter into a contract not with the administration itself but with the subsidiary company,” Lee Soo-yeon (’16, Media and Communication) pointed out during the Provisional Student Representative Meeting that secured the support of KU student representatives for the manual laborers. In other words, the administration’s cancellation of the contract between CNSAMC and the manual laborers was legally foolproof. Despite the perfect legality of its actions, the administration’s opponents took issue with its callous indifference toward the fates of KU laborers and students. One pernicious effect of indirect employment is that it “promotes labor flexibility, allowing the administration to lay off laborers with impunity,” as Lee put it. “Such a tradition consolidates the unequal power relationship between the de facto employer and employee, exposing the latter to terrible working conditions and discouraging full-time employment,” she added. Other student representatives further insisted that the administration’s indirect employment practices and its decision to hire laborers who work fewer hours ran counter to the current social climate that emphasizes the agenda of social justice and providing for the disenfranchised. There were further grievances concerning the administration’s behavior. As many students noted, to gradually replace the original laborers with those who worked less hours was tantamount to providing students with inferior services, which represented a blatant disregard for students’ welfare on the administration’s part. “Considering the amount of cleaning that is required every day, decreasing manual laborers’ working hours from eight to six or even three spells disaster for the educational environment of KU,” bemoaned Yoon Jeong-in (’15, Political Science and International Relations), the President of the College of Political Science and Economics. On January 30, the administration stunningly overturned their initial decision and announced they would continue to employ manual laborers from CNSAMC. While this marks an undisputed victory for manual laborers, it is questionable if the student body should be accredited for said triumph as much as it was. Although the student body did serve as an invaluable ally to the manual laborers, it is worth noting that the administration capitulated only two days after the Provisional Student Representative Meeting. This makes it too early for them to have made any meaningful strides against the administration’s decision. The administration’s abrupt and seemingly unmotivated concession further confirms that it willingly withdrew from its initial stance. The recent turn of events thus comes across as a calculated policy choice, not the unequivocal surrender that students yearned for. To that end, there is much that KUSU could have improved upon. “The Special Committee and KUSU put up campus wall posters, held press conferences as to publicize the issue, and focused on stopping Kobi employees from entering KU buildings,” Yoon stated. Yet whenever KUSU claimed a decisive victory over the administration, be it the annulment of the Future College plans or the gradual abolishment of admission fees, it did so through a combination of cunning and brute force. Earning the sympathy of influential parties such as the Ministry of Education or coming up with a realistic means, say, occupying the Main Hall and paralyzing all administrative functions, through which to enforce its will are just a few tactics employed in the past. Devoid of such further plans, the student body’s actions going forward will be an exercise in futility. In its haste to gather student representatives’ support for the manual laborers’ cause, KUSU stumbled into another pitfall during the Provisional Student Representative Meeting held on January 28. When a student representative suggested making several changes to the proposed plan of action, the conveners argued that any such changes could be added after ratifying it as is, in spite of the bylaws on meeting procedure stating otherwise. Even though they ultimately relented and the proposal was ratified only after it went through drastic changes, the mere fact that the conveners of a KUSU meeting entertained the notion of circumventing procedure is disconcerting, especially since similar misconduct could compromise their entire platform. Manual laborers and the administration remained bitterly opposed to the very end. Venues for conversation had been established, but they were all unequivocal failures. Given the bellicose climate as such that preceded the administration’s retreat, both the manual laborers and the student body should be careful not to take it at face value. Akin to how KUSU Star:zari established an Academic Affairs Committee after the Future College fiasco, KUSU ABLE must remain vigilant and introduce institutional safeguards against the possibility of the administration reneging on its promise. If the administration does go back on its word, the student body should be ready to continue its valiant struggle, albeit this time with more tact and grace.